Corey’s Dorey…, originally uploaded by pieceoflace. A beautiful picture of last weekend’s gnat. When we woke, it was raining. Today wasn’t supposed to be as nice as yesterday. Oh, well. It would still be better than shoveling snow or taking out the garbage. Our customers were Mike Russo, Joe Finkhouse, and Laurent Dubois. Pat, Pete and I were the crew along with The Captain who remained calm and vigilant. Since the wind was dusting up from the southwest, I decided we’d go north to look for standup water for Mike, who was a referral from NAUI Instructor Mike Lane (now of the British Virgin Islands) for his open water work. I chose Gully Cove because Lynn Colletti and I had used its little beach for other beginner students back in the day. Well, the beach is very eroded and rocky now. Mike and I stopped our snorkel swim short of the bouldery edge of it and stood on a hip deep flat-ish rock. Everyone else was scuba-ing happily in the clear, warm water of the cove. The visibility was easily 20 feet and it was in the high 50s on the bottom at 30 feet. Mike was doing great on his skills, so we had a chance to sight-see on the way back to the boat underwater. On his first open water scuba dive, he saw lots of crabs, a skate, a small lobster, and a black sea bass. I was towing the inflatable with our dive flag on it and the going was getting tough as we went deeper. Its painter wasn’t long enough to give me any scope as we swam deeper. Luckily, we were only anchored in 30 feet and I could manage that pretty well. Our second site was a small inlet on the north side of Straitsmouth Island, a.k.a. Fat Girl Cove. It’s the last place I ever wore a two piece bathing suit, but The Captain now explains that Rockport sends its FGs to the house on the island for R&R. What a BSer he is! The water was cooler here but the visibility in the shallows was still very good at about 15-20 feet. I found the biggest lobster I’ve ever seen and managed to gently pull him/her out from under a rock. There were no eggs and no tail notch. I’m not exaggerating when I tell you that my hand couldn’t reach across the back of its carapace. Pretend you’re stretching to make an octave on the piano. This lobster’s back was wider. Place your open hand down on your thigh and reach across it. This lobster’s back was wider. It took both hands to hold it firmly. I really couldn’t believe it was as strong as it was when I felt it writhe to be free of my clutches. My arms were jerked around in the water by the flipping power in its tail. I was relieved to get it back into its hole without any injuries to either of us. Where’s that videographer when you need him? Although it got dark as the afternoon wore on, the water was calm and the boat was lying comfortably at anchor. 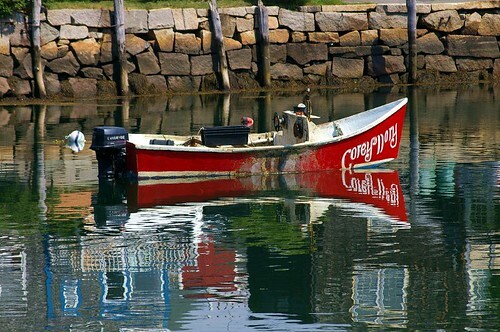 We were buzzed three times by a gnat of a Rockport lobsterman, but no one was hurt. We reported him to the Harbormaster, the Coast Guard, and the Rockport Chief of Police. If it ever happens again, I’ll be sure to video him and use it as evidence for the prosecution. There was hardly anyone else out today, but we saw Captain Fran Marcoux’s Daybreaker coming north as we motored south along the Lanesville side of the cape back to the marina. It was a good day with weather that was better than we had expected. Not a bad way to end the weekend. The sea was unsettled and, with virtually no wind at all, the boat rocked a lot when we anchored at any site on the south shore today. Nevertheless, I picked the deep side of Egg Rock for the first dive because I wanted a chance for clear water after a week’s worth of rainy days. It was only so-so. The water temperature was 50 degrees at 50 feet, but in the high 60s on the surface. We had Dan Turner, Al Ferzoco, Laurent Dubois, and Jacki K. with Pat, Pete, me, and The Captain onboard. I saw a decorator crab in an abandoned lobster trap at about 50 feet. He was only visible because his white claw-tip was poking up through the rope webbing on this old wooden structure. I gently tapped on the back of his carapace and he came out to see what was going on. I always marvel at how much is growing on their backs and this one was adorned magnificently. Of course, no two are exactly alike and Eggy had a brownish tendril of sea weed growing off the tip of his pointed “nose.” It wafted in the current and looked very spiffy. Everyone was glad to see how much there was to admire at this site even though the visibility and surge near the surface was minimal. Our second site was for the lobsterers. Norman’s Woe Rock is near the mouth of Gloucester Harbor. It often yields lots for the hunters among us. Today it was very warm and surgy. Laurent even went swimming in just his bathing suit. He’s a hardy Frenchman, of course. The day was going to be iffy, that was for sure. The weatherman predicted afternoon thunderstorms. It was foggy at 8 AM overlooking Magnolia Harbor. Not terrible, thick, pea soup fog, but rather wispy light fog. The humidity was oppressive, but the air was 75 degrees. We drove all around the cape, looking for the best conditions. It wasn’t until we were actually driving south with a boat full of customers and crew that I decided on the southwest corner of Kettle Island as being the best site. We had Kevin and Linsley Mordasky, Pat and Karen Hatcher, Joe Finkhouse, and Laurent Dubois with Kathy Cardinale, Veronica Atlantis, Pat Walsh, Peter Donahue and me as crew. The Captain gave us our marching orders. I anchored as close to the steep cliff at Kettle’s southwest side as I could. The tide was coming in and I didn’t want anyone to get into any current if I could help it. The depth meter said 47 feet and quickly climbed to 27 feet as Pete dropped the Danforth. We swung out and turned a little to point southeast. It was going to be a great site. We all were quick to get into the water even though the sky was overcast and hazy, with no blistering sun like yesterday. Pete reconfigured my wire buckles on the backpack and the 16 pound belt he was loaning me to better fit my Mares semi-dry and it felt wonderful to be so snug in the equipment again. Linsley and Kevin found some gear that some other diver had lost at the site earlier this season. I found a lobster bag with three legal lobsters in it which I donated to Joe Finkhouse. Laurent did very well on his hunt, as did Peter. By popular vote, we decided to stay at the same site for the second dive. Everyone was raving about the 20 foot visibility even though the temperature was 48 degrees at 48 feet, according to Pete. I swam close to the island and found the undercut area that had had many tests from dead sea urchins when I last swam through it. Today it was full of kelp and seaweed shreds and at least three, crushed lobster traps. It felt like I was swimming in the blue hole at Andros when I was there. The same overhead light and looming sides of rock occur at both sites. i felt weightless and sleek as I glided through the cut, down a steep gully, and out and over the boulders back to the anchor line. The day ended at The Gull Restaurant as we celebrated Pat Walsh’s birthday in grand style. I’m stuffed from the salmon and strawberry shortcake. A wonderful end to a great diving day. and sweaty. The sun was high and there was not enough breeze to keep the green head flies from biting. July was in full force. Jacki K. asked for Cathedral Rocks so we took her and Andy, Laurent, Richard Brandolini, John and Mike up the north side of the cape. Surgy conditions on the south shore from the remnants of Hurricane Bertha were repeated, but slightly diminished as we anchored just off shore of “the sofa” at Cathedral Rocks. There were low rollers and a disturbed surface and not enough wind to have us lie tight against the anchor. So we swung and bounced and sweated as we got suited up. I’m wearing my Mares semi-dry suit these days because the thought of getting into my dry suit is not appealing. But the Mares is tight and I needed Peter and Laurent to bounce me into it even though I’d soaped up to make it slip on easily. Once it’s on, however, I’m very comfortable and warm. Pete said it had be 51 degrees at 50 feet and 54 degrees on the surface. Chilly. He saw large flounders, tightly closed anemones, and a bottom current running strongly. Strange to have that at Cathedral. I think it was related to the high tide we were seeing from the full moon. The second site wasn’t clear until I rounded the corner at Halibut Point. The surges were still coming around the point and breaking on Folly Point. Not good. A little further on, however, it looked OK at the Cemetery along Lanesville shores. I anchored in 25 feet and everyone was quick to get wet again. This time, I went with the student, Mike, for exercises with his rented BC. He did just fine. Then we went for a scenic swim and saw an eel pout, several flounder that let us pet their tails, a skate, and a school of little coppery-colored fish that swam in front of us. We went through a thermocline at about 15 feet and noticed a current running north along the shore. The tide had turned. It was 54 degrees at 45 feet. Visibility varied according to whether you were below or above the thermocline – 20 feet below it and 10-15 feet above it. As we boarded the boat, Laurent returned with a large, but still legal, lobster that both he and Pete had wrestled with for most of the dive. There was triumph and hoo-hahs and all that. The ride home was hot and slow because we were running against a strong outgoing tidal current. Yet, we had fun and were glad there was no fog. Thanks to Andy, there were blueberry-filled Polish pasteries. Everyone was saying it. “What a NICE day!” It was sunny with low humidity and 70° above water. But, the flags around the edge of Gloucester Harbor along the boulevard were snapping with the brisk south wind at 8 AM. We were definitely going North today. We had a full boat with Linda and Myanna, Peter and Brenna, Patrick Scalli and Laurent Dubois. Brenna was going to be working on her scuba skills with The Captain on her way to being a certified diver. Linda and Myanna were going to be looking for lobsters. Patrick and Laurent were on their own. I thought we’d do well at The Restaurant at Folly Cove for the first dive. The water was very cold at 51° at 30 feet. It wasn’t very clear, for all that. The thermocline was visible at about 12 feet. Veronica and Peter Kelsey went to the rock wall for scenic viewing. There were lots of little perch coming and going from its nooks. Peter saw a sea raven that was docile enough to be handled. Brenna and Fred sank to about 25 feet to do doffing and donning and mask clearing. It was cold work. We saw a father and two little kids in one piece wet suits on a surf board paddling around the area. They had come out of the house next to The Lobster Pool restaurant right in front of us. They were thrilled to have him dive down for crabs and bring them up for their viewing pleasure. The oldest child was spralled over the board, crosswise, and had his mask in the water to watch. The littler one, a girl, was wearing a mask as well. Both had to have the mask straps short for a water-tight fit and had long earlocks of extra mask strap hanging down the sides of their heads. What a great way to get used to the ocean and what’s down there to see. We also saw Bonnie Sylvester Gavelis and her niece paddling their kayaks across the cove. They waved and declared they had no food when questioned by Peter Donahue, in The Captain’s stead. The second dive was just around the corner at the base of what used to be a motel. It’s now been sold as private homesteads and converted to many one-family dwellings. This time Laurent said it was 48 at 50 feet. I’m sure that was because the tide was coming in and there was a stiff off shore breeze. I got in to see if there was anything to video, but didn’t find any shot worth the effort. It was frickin’ freezin’. The water near shore was clear and warmer that at depth. I played in the shallows with the waves breaking over some rocks. Looking up from underneath the breaking surf was fun. I could pick out bubbles and little wavelets from the under side and it looked sparkly. Beautiful light too. As we packed up for the ride home, the back end of the boat was swathed in song. Linda and Fred were doing medleys of old songs that they both knew all the words to. It sounded like an Irish pub from where I was sitting. On our way back, the wind had freshened to about 15-20 knots. There were whitecaps along the Lanesville shore. As we put-putted our way down the Annisquam, we saw Captain Fran Linnehan’s Down Under and Captain Fran Marcoux’s Daybreaker bringing their afternoon charters north too. As he had on the way up, when we got to Thurston’s Point, Fred called to Patrick Scalli’s mother, Mary Scalli, on the hailer. He loves to do that. She came to the window to wave back at us. The channel was narrowed as we went under the A. Piatt Andrew bridge by a large sailboat that had run aground on the Lynn Colletti Memorial sandbar. They were pretty well wedged and we saw their waterline was about 6 inches above the real water’s surface. The Coast Guard were nearby but it seemed they’d agreed not to do anything drastic, given the tide had already turned. The Captain docked the boat to applause all around. And it was on a weekend. What bliss. We were looking forward to having Larry Finer with us today, but learned from Al Ferzoco that he’d been hurt at work on Friday afternoon. He’s at MGH, with severe burns and several broken bones, in a medically induced coma. Our thoughts are with him and Janine. Please send some healing vibrations his way. We miss him and are wishing him a speedy recovery. The plan was to take Candace, Al and Pam’s daughter, for an introduction to scuba at the little beach on Kettle Island. We talked Pam into getting into the inflatable as well. She sat on the beach, taking pictures, as Pat Walsh and I worked with Candy. That went very well and she was scuba-ing up and down the beachfront by the end of two hours. The rest of the crew were at the southwestern point of Kettle Island for their regularly-scheduled program. There, Kathy Cardinale tried Pete’s DUI drysuit and declared herself warm enough in it. Laurent reported he’d seen a sea raven trying to eat a flounder – sideways. The flounder didn’t seem too concerned and wasn’t struggling. Where’s the video camera when you need it? Our second dive was at Divers’ Leap. This time, Laurent and Al went their separate ways – kinda, sorta looking for lobsters. Tim Maxwell and Pat were just sight-seeing. Candy and I were on the surface, watching the action below. When she got tired of swimming, we climbed back into the boat for Pam’s sandwiches. What a tasty treat to have the customers bring food that they share with everyone. There were even chocolate chip cookies. I finished off Candy’s tank under the boat and found a huge hermit crab in a moon snail’s cast off shell. When I brought it up to show, everyone was suitably impressed that it proceeded to come almost completely out of its shell on the deck. It didn’t seem to be too stressed by the adventure of being “captured by aliens.” Pat and Candy reported that the tail part of its body was slender and worm-like in contrast to its big claws in the front. It had blue-green eyes on stalks with a reddish carapace and pincers. The water was in the high 60s at Kettle Island beach. It was 51 at 30 feet at the point at Kettle. The tide had turned and was coming in. I could see the thermocline at Divers’ Leap and it was co-o-o-old below it. Visibility was about 20 feet on the first dive and about 15 feet at the bottom on the second. In total, it was a beautiful day with nice people. Laurent says it’s called brouillard in French. Well, we had a heap of it today, Sunday, July 6th. We had eaten our Dunkin Donuts’ breakfast overlooking Magnolia Beach at 8:30 AM and the water was so flat that the boats on their moorings were pointing every which way. No wind. No waves. We decided to come south with the full charter of six people because the conditions looked so good that way. By the time everyone was on board – customers Ilya and Leni, Laurent, Andy, MIke and the other Polish guy whose name started with M, plus crew Veronica, Pat, Pete, The Captain and me – the sun was dimmed behind hazy overcast. As we powered down the Annisquam to the Blynman Bridge, Peter called down to look at the fog bank that was cloaking the marsh to our right. Oh, no. Not again. Sure enough. As we pulled into Gloucester Harbor, we couldn’t see past the last can marking the channel for the bridge. No rocks at Stage Fort Park and no Ten Pound Island. It was coolish and the mist sliding across your face felt wet. The sun wasn’t visibile above and everything on all sides was white. This was not going to be good for diving. We won’t put people into the water if we can’t see them when they surface away from the boat. Sound is muffled and its source’s distance and direction unreliable when there’s heavy fog. No one wants to feel unsafe when they’re diving. So we putt-putted over to the transient mooring at Half Moon Beach and hooked up. Now what? I was taking a beginner into stand-up water with Veronica, so we got dressed and jumped in with just our suits and fins. Leni seemed eager to get started with her class and so we fin-kicked to the beach. The rest of the customers were getting geared up as we left, but I knew we wouldn’t be charging any of them for the trip because it’s free when we can’t leave the harbor due to weather conditions. That way we don’t put anyone at risk and they don’t feel they’ve been short-changed by us. Veronica is a great co-teacher. She is just about Leni’s size so her examples and demonstrations are very pertinent. We got through the snorkeling skills quickly and proceeded to scuba rig donning and doffing, and scuba regulator clearing and retrieval. Again, great progress. We determined that her weights were going to need to be somewhere between 15 pounds and 22 pounds on her next dive. We were working with mask clearing and breathing from the scuba tank on the surface with no mask when The Captain hailed us to return to the boat. The other folks were done with their dive and, since the fog hadn’t lifted, voted to call it a day. As we returned to the marina, the fog bank was being blown on shore and into the parking lot. It still hadn’t burned off by 1:30 when we left Magnolia for Pete’s place in Waltham and his cookout. Oh, well. Let’s hope everyone can come back another time for better conditions. We saw Cathy Myers and her family and friends as well as Dr. Don and Ken, Dino and Lynn with Christopher and Nicolette, Pam and Chandra, many of Peter’s family plus Billy and Frankie at Pete’s. There were also many, many lobsters all bright red, steaming and ready for eager fingers with nut crackers. Did You Say BLUE Lobsters? Tom and Catie Childress joined us from Amherst, MA. They brought a chocolate cake that Catie had made to share with everyone because Tom’s 60th birthday had been last Wednesday, July 3rd. What great customers! They come bearing food! The first dive was at Bemo Ledge. It was 25 feet deep and 59 degrees up in the surgey shallows, according to Peter. Catie, Tom and I found a too-big lobster under a rock and were amazed at how big the white bumps were on its claws. They looked like acorns. Catie and I looked for critters to video/photograph. We found crabs, lobsters, and flounders. There was a current running, so we swam into it and thus east. The ride back to the boat was quick because the tide was helping us. Now, about those blue lobsters. We had anchored near Cape Ann Divers’ big boat at the mouth of Brace Cove for our second dive. It was about 17 feet deep. Pete and Laurent went in first. By the time Catie and I were getting into the water, Pete was back with an unusual lobster to show us. It had a definite blue color to its shell, especially at its joints. I hope the video does it justice. Later, on the boat, Tom said he had seen and held four more, although none were big enough to keep. Pete found a sandy patch where little fish disappeared under the surface as we approached. He used his long lobster probe to dislodge them for the benefit of the camera. I think they were eel-like critters, but they swam away so fast as they were disturbed, I couldn’t tell for sure. As usual, Catie did wonderfully well. She is a fearless, gentle holder of anything she finds on the bottom. That helps me take its picture. We shared marble birthday cake with chocolate frosting and red sprinkles and pronounced it a great day, even though the sun never really came out. The foggy, rainy weather continues. We had Curt and Ray today, along with Laurent. They decided Kettle Island looked good and went to a different place than we ordinarily anchor. Pete chose this place for the first dive. He said it was 51 degrees at 50 feet. There were skates and flounder and lobsters to be seen. The second dive was a little more challenging. It was on the ocean facing edge of the island. Here. That makes it the southern-most side of the island. He said there was a current running as the tide came in. The bottom was clear but cold. Visibility was about 20 feet. Curt and Ray did fine and said it was one of the best dives they’ve had in New England. High praise, indeed.